Articles Custom Saddle ~ Is It Really? Custom Saddle ~ Is It Really? We have had quite a few of our customers come to us who are very skeptical because of a bad experience with a custom saddler in the past. Some didn’t like the way the saddle fit them. Some didn’t like the way the saddle fit their horse. And some didn’t like the way it fit them or their horse. The term ‘custom saddle’ can mean a different thing depending on who you are talking to. Sure you can pick the color and some shiny conchos but for us there are 4 very important things, at minimum, that must be considered if it is truly a custom saddle. Fit for the horse, seat size, seat width, fender length. Before my wife got cancer and we had to slow our lives down we used to travel about 5 months out of the year to all of the big horse shows around the country. One of my favorite things to do when we had a little down time was to seek out other custom saddlers to see how we compared to them. I was always amazed at how few of these so called custom saddle makers were using anything more than a wither tracing to fit the horse. Others only asked for a couple of pictures. Some just asked what breed the horse was. First of all, a wither tracing only gives you about 1 to 2 inches of usable information on a horse’s back. That leaves about 90% of the rest of the back that we have absolutely no information on. Secondly, pictures are two dimensional, a horse’s back is three dimensional. There is no accurate way to look at a picture and turn that into three dimensions. Lastly, 100 years ago you might have had some success fitting a horse just by knowing what breed it was and what part of the country it came from because breeding was localized. Nowadays, because of artificial insemination, a stallion in California could produce a foal with a mare in Florida without them ever being in the same location at the same time. We believe the EQUImeasure Kit is the ultimate saddle fitting tool for the horse. With an EQUImeasure Kit you can make a three dimensional mold of the horse’s back. It’s like having the horse right there in the shop to do the fitting! Western saddle seat sizes are very arbitrary. Some saddle makers measure from the base of the horn to the center of the cantle. Others measure from the top of the hand hole to the middle of the cantle. 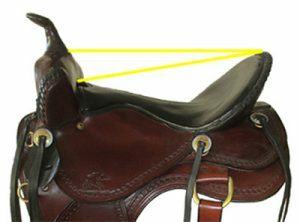 On the same saddle this will give two different results. Not to mention that neither of these measurements tells us anything about how much actual room the rider needs between the base of the swell (or pommel) and the base of the cantle for the thigh to comfortably pass through. Using a little math we can very easily calculate the minimum thigh opening between the swell and cantle. Remember circumference and diameter from geometry? The diameter of a circle is the circumference divided by Pi. One of the measurements we get from the rider is the distance all the way around the widest part of the thigh (circumference). If you have a 24 inch thigh, you divide by Pi (3.14) and you get the diameter, 7.64. Add in one inch for some operating room and you come up with 8.64 inches. So we know we have to have at least 8.64 inches between the swell and cantle. The overwhelming majority of custom saddle makers will make a decision on seat size based only on height and weight of the rider. You could have two people, both six feet tall and 180 pounds, with one measuring 21 inches around the thigh and the other measuring over 24 inches. Using our formula this is the difference of a whole inch in seat size. It depends on where you carry your weight. This is a tough one for the ladies. Most custom saddles are built by men with no consideration for the difference in shape and size of the pelvic girdle between a man and a woman. This is why we get a measurement for the distance between the seat bones. Most saddles are too narrow for a woman. 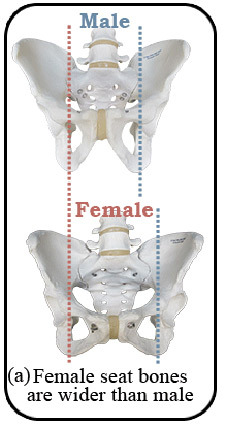 A male’s seat bones average from 3.25 to 4.5 inches. Women vary even more from 3.5 up to 6 inches! Most saddles don’t have enough support area farther out from the center of the seat to accommodate the wider pelvis of a woman. You could have a slender 6’ tall man and a woman who is 5’3” and they could have the same sized thigh meaning they would use the same sized seat. However, their inseams could vary by as much 5 inches. The fender length needs to be tailored to the inseam of the rider. 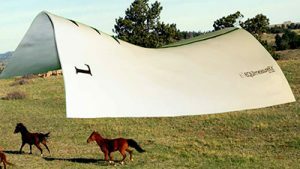 You can see on almost every horse forum there will be posts from a rider who is looking for a solution for a fender system that either won’t adjust short enough or long enough. If you are in the market for a custom saddle make sure you ask the right questions to determine exactly how ‘custom’ the saddle will be. I think now you can see that just because a saddle maker says he is a ‘custom saddle maker’, your definition of a custom saddle might be a lot different than his. Thanks for explaining custom fit to a much higher degree!! Having read this article describing the truly custom-made saddles I am looking forward to my future saddle purchase with you! My horse is still a baby…..so will be waiting for her to mature before getting her measured for saddle fit. We’ll be here when you’re ready Steve!